What programs does Voices Together offer? Who do you serve? 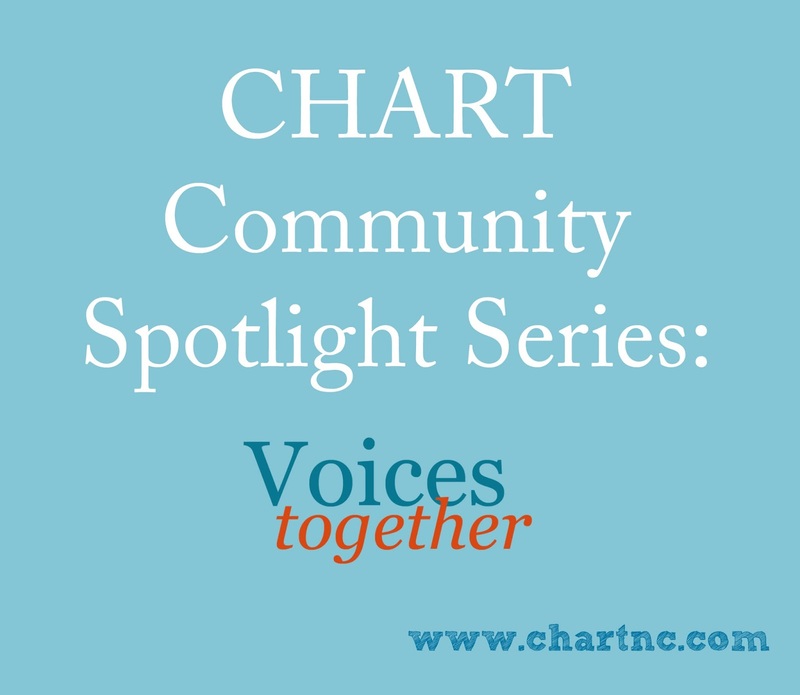 Voices Together uses music to help children and adults work toward individual developmental goals and improve academic, social, emotional, and communication skills. 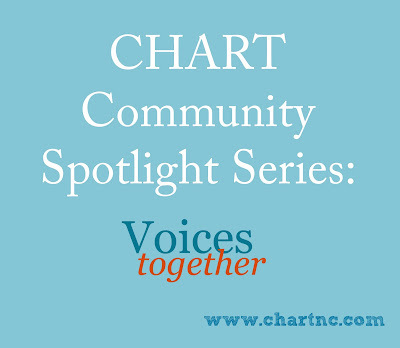 At Voices Together, we offer multiple opportunities for clients to engage in group music therapy sessions throughout the Triangle and Triad regions of North Carolina. These include music therapy offered through facilities such as schools, community groups, and vocational centers, partnerships with summer camps, and weekly groups for young children, teens, and beyond! Voices Together Music Therapy is an effective form of therapeutic support for children and adults with a range of needs including Sensory Processing Disorder, Autism Spectrum Disorder, developmental and intellectual Disabilities, Down syndrome, Cerebral Palsy, and learning disabilities. Voices Together featured on WUNC TV. How does music therapy benefit individuals with developmental disabilities? Voices Together Music therapy is an effective tool for stimulating, and motivating speech, and provides opportunities for both verbal and nonverbal communication. Our model of music therapy helps improves social skills, develops communication, improves self-esteem and self-control, and reduces anxiety. What was the inspiration to start Voices Together? What are your future plans and aspirations? Voices Together was founded to address the growing needs of individuals with developmental challenges to learn and practice skills within a group setting that would help them generalize those skills with peers, in their family, classrooms and in the community. Our unique approach is based on full engagement to learn, validating each individual’s unique perspective and assuming competency. A Voices Together school session in progress. Image courtesy Voices Together. How can community members support the important work of your program? Join a Group. For more information about joining a voices together group call 919-942-2714 or visit www.voicestogether.net. Make a Donation. Donations to Voices Together make a profound difference in the lives of children and adults with developmental disabilities. Services provided by Voices Together are not covered by health insurance, and families often need help paying for the services they need. Please consider making a donation online to support our community scholarship program. 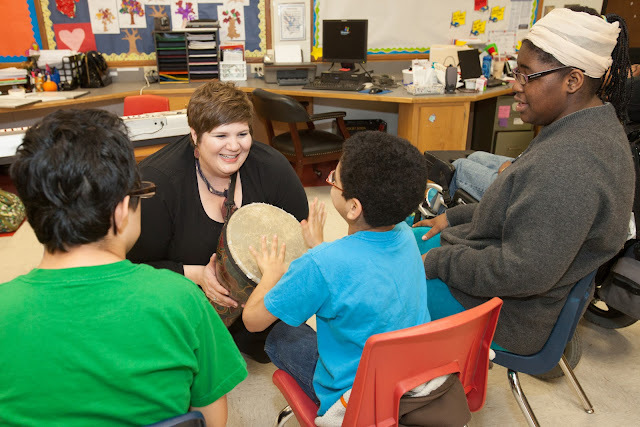 Voices Together founder and CEO Yasmine White has spent nearly three decades as a music therapist and has devoted most of her career to working with children, teens and adults with developmental disabilities such as autism. The techniques and methods that form the core of the Voices Together program are the product of those years of hands-on work. She is a board certified music therapist, has a degree from the University of Maryland and has taken advanced studies in music therapy. She has written articles and presented internationally and is currently on research teams for projects with Duke University. We hope you enjoyed this interview. Who would you like to hear from next? Please leave a note in the comments. And be sure to check out our summer kick off post to help make summer 2015 the best one yet!